Valentine’s Day is coming up, and many couples are ready to show off to the world what the perfect pair that they make. For a good example of a pretty good pair, one doesn’t have to look any farther than a downtown steakhouse. One of the leading pairings in all of dining is that of a juicy steak and a deep, red wine. Even though most people know that there are flavorful benefits to this combination, there are actually other perks that go beyond the taste buds that most people are unaware of. So, why do red wine and steak go so well together? The answer is actually pretty scientific. The grapes that are used to create wine contain tannins. These tannins are the key component to the taste that steak lovers can’t get enough of. Remember, the perfect cut of beef is going to have an even amount of fat dispersed throughout. When the tannins combine with the proteins and fats of the beef, the molecules of each product work with each other to create a unique experience. Tannin softens the fat of the meat and creates the juicy taste, while the flavor of the beef stabilizes the strong essence of the wine. 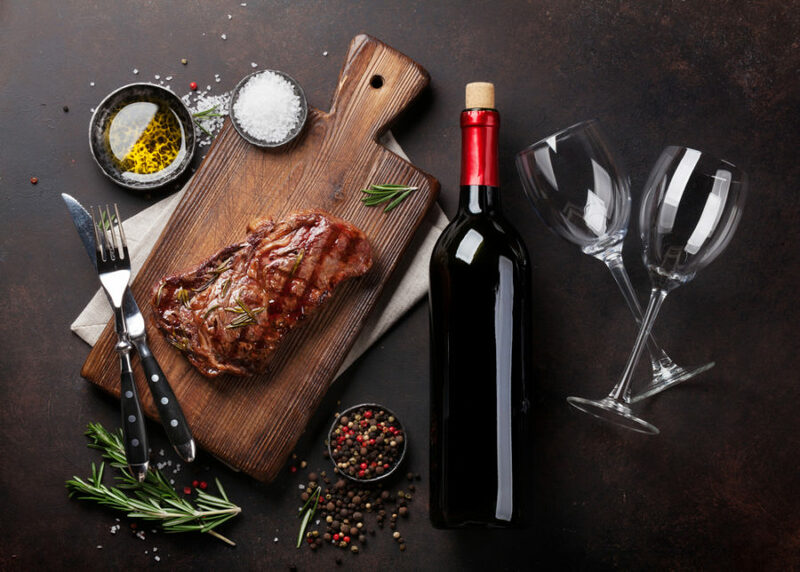 Aside from the dining experience itself, there are actually some interesting health benefits to combining red wine and beef. Most people know that while red meat does have its health benefits, eating steak dinners at a local steakhouse should be done in moderation. What’s really cool about this pairing is that the antioxidants in the wine can help patrons enjoy just a bit more meat with their meal. The wine has the ability to break down some of the cholesterol found in beef and reduces the risk of cholesterol threatening the arteries with a deadly clog. Pairing the right wine with the main course at a traditional Texas steakhouse isn’t as easy as just serving up a bottle. The secret to a wonderful pairing is all about the cut of meat that you are serving up as well as the flavor that makes up the final product. This rule-of-thumb is an easy one to remember: Bold dishes go great with bold wines (T-Bone and a Cabernet Sauvignon), and leaner beef offerings go well with lighter wines (Pinot Noir with a Filet). Enjoy Fine Wines and Downtown Steakhouse Dining at Y.O. Tonight! Sometimes, a steak connoisseur needs the guidance of a trained server from an exquisite steakhouse when seeking out the perfect wine for a perfect steak. Y.O. Ranch Steakhouse is located in the historic West End District of Downtown Dallas and is proud to host some of the best selections of wine and organic beef. Don’t take our word for it. Make a reservation today and come try out some locally bred beef with some of the nation’s finest wines.